This is a very long post.... I've just listed a lot of carols in alphabetical order, but within categories, so you can find the ones you want fairly easily. I hate labelling things as "kid's songs" because I find that kids really like the traditional carols if they get a chance to, so I've called one category "Child-focussed". These might be particularly helpful if you are planning a pageant! I've put the traditional carols at the end of the post, because you probably know which ones of those you want to sing. *CoC03 All over creation (Shirley Murray) These words will wake up your congregation. Particularly good for Christmas Eve or a Christmas night service. Challenging words. Nice lilting tune. Lyrics. StS025 / LBW074 / GtG160 / G(II)269 / GC356 / CP(E) 42 / W&R206 / Cha141 / 82Hml-104 A Stable Lamp Is Lighted (Richard Wilbur) Starting From the stable, ending on the cross. This has a nice celticish tune, which is simple to sing, and a refrain of "and every stone shall cry". I like it. Lyrics and links to youtube videos of two possible tunes. Sound sample and sheet music from Ana Hernández; this version is probably better for a soloist. It's lovely. SP&P110 With one voice the angels sing / Love has come (Matt Maher) This is a very joyful new Christmas eve, or Christmas day song. I really think a choral arrangement of this would work. SP&P has more inclusive lyrics than the original, so seek that out. It also skips the bridge part, that doesn't work so well in my opinion. Nice choral version. God Comes Tomorrow (Iona) Give us this year (Iona) Beautiful words seeking a more mature response to Christmas, sung to an old hymn tune (NEUMARK). The tune is not familiar to me, but is not difficult to sing, and if you have a choir, sounds particularly lovely. New words to old tunes. Lyrics. *AA012 / CoC08 / STB141 Child of Christmas story (Shirley Murray) A lovely Christmas song; very focussed on the Christ child. Simple tune. Lyrics and sheet music. StF211 Night of peace: hail the holy child (Daniel Damon) A simple and quite beautiful new carol. This would not be too hard to sing. It's pretty lovely. *AA014 / CoC09 / STB144 / StF194 Child of joy and peace (Shirley Murray) Excellent words for Christmas and Epiphany; recognises the poverty of Christ and constrasts it with the greed of Christmas - without being too heavy handed. I like the Ian Render tune (JENNIFER'S GIFT) best, even though it's a little tricky. Lyrics and sheet music. VU40 / WoV636 / GtG125 Before the marvel of this night (Jaroslav Vajda) Excellent, otherworldly words, and a beautiful tune. "Sing bliss, sing bliss, sing endless bliss!". Clunky sound sample. *CoC15 Come now where we least expect you (Marnie Barrell) Challenging words and a tune that could be pretty groovy. "Christ is found far beyond our sacred ground". Indeed! Lyrics. Online resource / MV047 Born in human likeness (Bruce Harding) A simple Christmas round. Good for kids. Sheet music. *MV158 / FFS12 Dream a dream (Shirley Murray) Broad words of hope for the future of creation and the world's people. I think the first tune in Faith Forever Singing (by Nigel Eastgate) is the most intuitive and interesting. GIA music also have a tune by Lori True which fits together with Dona Nobis Pacem which could be really lovely if you have a choir, especially a children's choir (sound sample). Lyrics and the Nigel Eastgate tune Lori True version can be purchased online from GIA. *Iona (M&G) / CH359 / MV033 / GtG137 / ZSS54 / StJ / ELW253 / GA293 / SFFS 2085 / G(II)276 / GC370 / GC(II)364 / G(3)429 / CP368 / W&R402 He came down that we may have love/ Jesus came bringing us hope (Traditional Cameroon) A lovely simple song - you can make up words and have a lot of fun with this if you also use some drums. Lyrics. Good for kids. *Cha158 Her baby newly breathing (Brian Wren) Realistic words of Mary's motherhood of a real life type of infant, to the familiar tune MERLE'S TUNE. The final verse sings of creating Wisdom "constricted into maleness, and of a woman born". Lyrics (set to a different tune). New words to old tunes. *CoC28 I didn't hear the angels sing (Iris McCoy) Lovely statement of faith despite not having witnessed the Christmas events. Simple tune. *CH329 / AA108 / CoC33 O little Love who comes again (Shirley Murray) A lovely gentle and thoughtful Christmas song, which would also work for Epiphany. Lyrics and sheet music. Online Resource Like a Child (Daniel Damon) A simple song about all that we can learn from children, and the Christ child. Lyrics and sheet music. *MV149 / CoC35 Peace for our children (Doreen Lankshear-Smith) A simple and quite repetitive (in a nice way) song that prays for peace for children, women, men, families, nations… and the soul. ELW292 / GtG110 Love Has Come (Ken Bible) Christmas A lovely song of love being born. A good song for kids to a simple French carol tune. Lyrics Good for kids. New words to old tunes. AoV2-043 / ATFG520 / CoC40 / NCH538 / SFFS 2095 / GC(II)355 / G(3)449 / SP&P174 / W&R223 / ZSS63 / VF035 Star-Child (Shirley Murray) A lovely lovely carol. Very easy to sing. A big favourite! Lyrics and sample sheet music. 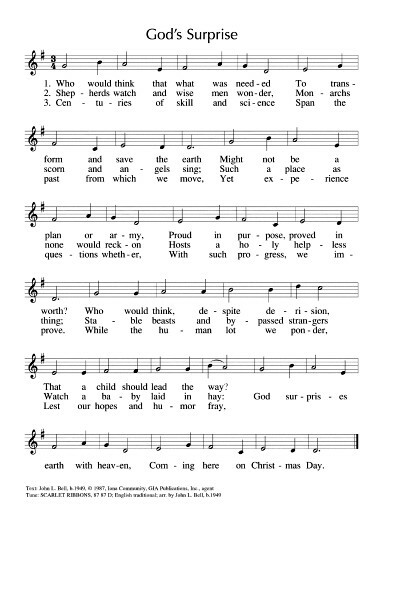 *TiS 287 / CH287 / StS011 / GC(II)768 / G(3)876 No wind at the window (John Bell) Wonderful words to the familiar Celtic tune COLUMCILLE that focus on Mary's decision to say "Yes" to God. Very easy to sing. Works well for Advent and Christmas. Lyrics. Sound sample. New words to old tunes. VU97 / GC(II)376 / G(3)450 When a star is shining (Where the Promise Shines) (Sylvia Dunstan) would also be good for Epiphany. Sheet music. *AA154 / CoC48 Where is the room? (Shirley Murray) More beautiful words of hope and peace and hospitality. Simple tune to sing. Lyrics. Songs from the Still Strange Land The stillness of anticipation / Turning point of time (Neil Quintrell / Doug Simper) I really love this Australian carol. It's not easy for a congregation, so will need to be taught. *AA159 / CoC50 Who is the child that is to be born? (Shirley Murray) Lovely lilting melody and beautiful words. Maybe more Adventy? Unusual source When our God came to earth (Tim Spencer and Steve Vent) These words are to the same tune as “Long ago, prophets new” (THEODORIC). "Let the poor rejoice! Let the mute give voice! Love is shown, God is known, Christ is born of Mary". Lyrics. New words to old tunes. *GtG120 Where shepherds lately knelt (Jaroslav Vajda) Excellent and quite personal reflective words recognising faith in the midst of doubt. The tune is lovely, but will need to be taught, or sung by your musicians. Lyrics and a youtube video. *Iona / NCH153 / GtG138 / CH295 / G(II)267 / GC350 / SP022 / StF222 Who would think that what was needed (God's surprise) (John Bell) I love the challenge to our priorities in this song. The lyrics are to the traditional tune SCARLET RIBBONS. Lyrics and sample sheet music. Keyboard sound sample. New words to old tunes. *Online Resource Within a stall a baby lies cradled (David Wood) Inspiring words for Christmas Eve full of hope for a better world. Free sheet music. Online resource A babe was born a little one / Winter's child (Daniel Damon) A gentle storytelling song with the repeated line "in the dark'ning time of the year. Very simple to sing. Sheet music and lyrics. Jazz arrangement. VU049 / CP129 No crowded eastern street (Frieda Major) This song is a good Christmas hymn for those who live in the plains or prairies in the Northern Hemisphere. Lovely words, and a simple tune. *A&M185 / GC(II)362 / G(3)434 / SP69 Dark is the night / Sing Alleluia (Patrick O'Brien) Excellent and simple Christmas song which reflects the magnificat and the happiness of Jesus’ parents. I especially like the last verse “Hope for the poor, release for the captive, Love for the outcast, light for weary eyes; Word that brings life, embracing humanity, Jesus, companion be born into our lives”. It would be particularly good for a Christmas eve service. The chorus would also work very nicely on its own. Lyrics and sheet music sample. Mushy sound sample. Available for purchase online. VU078 Sing till sundown hum your joy (Eileen Spinelli) A song for snowy places. This is a quite delightful song of hope "Now we're dancing through the snow"! G(II)274 / GC365 / GC(II)360 / G(3)432 Silent in the Chill of Midnight (Francis Patrick O'Brien) Quite nice Christmas lullaby. Northern Hemisphere specific. AA028 / CoC16 / STB145 Come to this Christmas singing (Shirley Murray) Joyous sheep-farming, beach-loving Christmas song. New Zealand specific because of the word "aroha", unless it fits your congregation. Lyrics and sheet music. TiS 322 / AHB 246 The north wind is tossing the leaves (John Wheeler) Dusty Australian carol. Lyrics. Online Resource Christmas in Australia (Heather Price) Good fun song about Australian Christmas traditions, including beaches, picnics and caring for the poor. Sheet music and recording. Unknown Source The Silver Stars are in the Sky (John Wheeler) This is a lovely gentle nativity song with Australian birds and dust and animals. Youtube. Lyrics. *ATOK 318 / Iona (SBL) / CH762 / MV036 / WoV788 / SFFS 2033 / SP&P078 / URW403 Glory to God / Gloria di dios (Peru) Good fun. Great for kids - call and response. SFFS has a good Trinitarian formula for it. Good for kids. *TiS 773 / ATW 431 / NCH756 / CH760 / UMH072 / VU37 / WoV640 / GA291 / G(II)199 / GC(II)253 / G(3)426 / W&R240 / Cha034 / URW380 Glory to God / Gloria Gloria (Taize) The refrain is excellent - joyous, simple, a round. Everything. The verses are not great. Good for kids. Iona (TI1AU) / MV038 Glory to God / Nzamuranza (Mozambique / Matsikenyiri) Simple African call and response song. Great harmonies. CoC20 Gloria (Jillian Bray) A pretty majestic gloria in 4 part harmony. CoC23 Gloria in excelsis (Colin Gibson) This is a pretty groovy gloria, with some modernised words "Peace be to all on this earth that we share. Peace the be vision and peace be our care". CoC21 Gloria (Colin Gibson) This Latin gloria could be sung as a simple chant, a 3- part canon or a four part chorale! GC(II)190 Glory to God in the highest (Beneath the Tree of Life) (Marty Haugen) Communion response A good joyful Gloria. Just needs a word substituion for "his people" to "God's people". The sound sample actually does that and it still works well. *TiS 731 / SFFS 2017 / GtG155 / G(II)377 / GC557 / GC(II)535 / G(3)618 / W&R212 / PfAS100G / URW383 / Lau691 Raise a song of gladness / Jubilate Servite (Taize) Glorious, fun round. 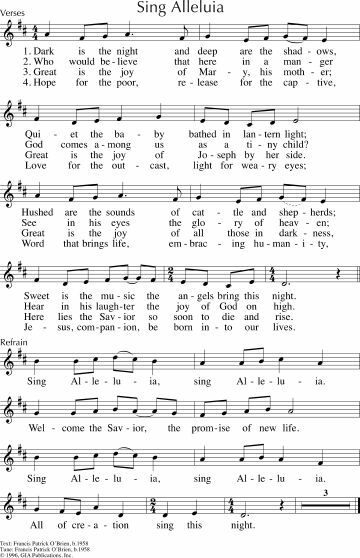 If your congregation balks at singing in Latin, it can be sung in English as "Raise a song of gladness, all the earth, Christ has come, bringing peace, joy to every heart, Alleluia Alleluia, Joy to every heart (x2)". This is not a Gloria, but it has the feel of one! NCH154 / UMH251 / VU43 / LBW070 / ELW290 / HPP110 / PH029 / GtG136 / GC359 / GC(II)363 / G(3)428 / W&R218 / Cha167 / ZSS59 / 82Hml-099 / Lau164 / MP179 Go tell it on the mountain (John Work) Very simple and lots of fun. There are lots of versions of the lyrics. Good for kids. CH310 / CP(E) 68 / W&R227 / StF216 See him lying on a bed of straw (Perry) This song (Calypso Carol) is cool, especially if you get some crazy bass singing action happening. I have a 3 part a capella arrangement that I did of this a very long time ago which uses that approach. Good for kids. STB134 Sun has gone night has arrived / Bheri goth chharda ni chharda (Manaen) A pretty Christmas song from the Shepherds' point of view from Nepal. This would be best sung by a soloist at first. STB136 Tonight We See The Light Of The World / Ai domma tubuh saborngin on (Saragih) Christmas A humble carol from Indonesia in English and Bahasa. "Behold! Born in straw-covered manger, the whole world's baby Lord". STB137 In The Fields Of Efrata / Di ladang Efrata para gembala (Simamora) Christmas A good carol from the perspective of the Shepherds. In English and Bahasa. The tune will need to be taught, but it's really pretty. STB140 Holy night blessed night (Zhu / Wu / Shi) Christmas I like the words of this. The melody is not easy for a Western congregation. Perhaps a soloist could sing it. Verses in Mandarin or English. NCH137 / VU52 / PH052 Sheep fast asleep / Hitsuji Wa Nemure Ri (Miwa) Japanese carol. Very peaceful. ATAR631 / NCH161 / SFFS 2072 / PH299 / W&R249 / ZSS207-d Amen Amen / See the little baby (African-American) This is not so well known in Australia, where it may be better sung by a choir, or as a call and response; the response will need to be taught. Good for kids. *TiS 307 / AHB 232 / CH300 / VU73 / SFFS 2098 / G(II)264 / GC345 / GC(II)378 / G(3)454 / CP128 / ZSS60 The Virgin Mary had a baby boy (West Indian Traditional) Love it. Make sure you note the timing of the music - it's not quite what most people anticipate. Good for kids. NCH151 / Iona (SBL) / UMH244 / VU071 / LBW072 / ELW284 / HPP119 / PH061 / GtG142 / G(II)272 / GC361 / CP146 / W&R213 / Cha166 / 82Hml-114 Twas in the moon of wintertime (de Brebeuf) I love this one, and it does a good job of making the Christmas story Native American. FFS46 Lullaby sing lullaby (Peter Godfrey) This could work in a Christmas Pageant, or be used as a family lullaby during the Christmas season. *Online Resource Are you ready? (Heather Price / Davies) This is a fun song for kids, which could be sung with actions, I reckon. With a chorus of "Are you ready? Christmas is here! Shake your hands and feet, dancing to the beat. Wiggle your toes and reach for the stars, open wide your heart 'cos now it's time to start. This is the Christmas story, we can sing and shout, [...a bit I can't work out...] There's animals and angels, a baby and a star, a message of peace that has travelled far". Would be a great start to a Christmas pageant, as it mentions each of the characters and their role in the story. Good for kids. Sheet music and recording. Online Resource Gifts from the Stable (Heather Price / Davies) This would be a lot of fun for smaller kids, or for a Christmas Pageant if you want to focus on the animals that may have been present at the birth of Christ. Good for kids. Sheet music and recording. CH302 / StF206 It was on a starry night when the hills were bright (Webb) This could work well in a Christmas Pageant. Online Resource Christmas Letter (Heather Price / Davies) A quiet song, not a congregational song, but a nice solo bringing us reminders of the reason behind all the Christmas hustle and bustle. This could be sung by an adult, for the children, or taught to a children's choir. Based on the letters of C-h-r-i-s-t-m-a-s; ah, so you could use cut-outs of each letter if you want to do something fun! Sheet music and recording. StF203 I had a dream that I was standing on a hillside (Piercy) This might be fun for shepherds to sing, with the congregation joining the chorus, in a Christmas Pageant. *AoVK-60 / AA004 / CoC05 And did you see him little star? (Clyde / Gibson) Good words. Simple to sing and great for children. I like the idea of the star being the observer and the guide. Good for kids. *?AoV2-168 / ATA 134 / GGives2 At Christmas time the birds all sing / Christmas in the scrub (Newton) Silly and fun Christmas song for Australian kids. Good for kids. NCH141 / AA009/ CoC07 Carol our Christmas (Murray) A fun Southern Hemisphere Christmas song. Good for kids. *ATAR683 Sleep, little baby (Mann) Christmas A good song about the Christ-child. Great for a Christmas Pageant. I like the final phrase "You are the end of fear". Good for kids. Online resource Celebrate Emmanuel (MacGregor) This is a simple song, which you could use with the verses, or just sing the chorus. Sheet music. Good for kids. *Online resource Christmas time - we celebrate! (MacGregor) A good song for kids. I don't think the sound sample shows how cool this song could be... use some imagination and have fun with it! Good for kids. CoC12 Clippety-clop clippety clop (Wise) A fun kids' song about the donkey ride and the lack of room in the inn. Good for a pageant! Good for kids. ATAR594 Donkey donkey (Newton) A fun song - we have used this for our Christmas Pageant. It's catchy! Good for kids. CoC17 Don't tell anyone (SHHH! Not anyone) (Gibson) This song would be just perfect for a leader + kids to sing at the start of a Christmas Pageant. Good for kids. *CoC19 Get up get up no time to yawn (Gibson) A very fun song for Christmas morning. I think it would be pretty straightforward to sing, but given the number of visitors on Christmas day, it might be good to get a group to sing it. "Come friend, come stranger, here's no danger, follow shepherds and kings to the manger where Christ, the Christ is born". Good for kids. ATOK 338 In a dusty old place called Bethlehem / God in human shoes (Thiele) Good for kids. NCH138 / UMH227 / VU056 / HPP98 Jesus our brother strong and good / kind and good (French carol) Good for kids especially. Good for kids. *AoV2-043 / ATFG520 / CoC40 / NCH538 / SFFS 2095 / GC(II)355 / G(3)449 / SP&P174 / W&R223 / ZSS63 Star-Child (Murray) A lovely lovely carol. Very easy to sing. A big favourite! Lyrics and sample sheet music. CoC42 The jersey cow came mooing (Gibson) Fun song for little kids with lots of animal sounds at the stable. Good for a pageant, too. Good for kids. *CoC46 Two tired people asked for rest (Tayler / Sheehy) Good song for a Christmas Eve pageant. I suggest getting the congregation to just join in on the chorus "No room, no room, you can't stay here, we can't take any more, but in the stable you can make a bed upon the straw." Good for kids. 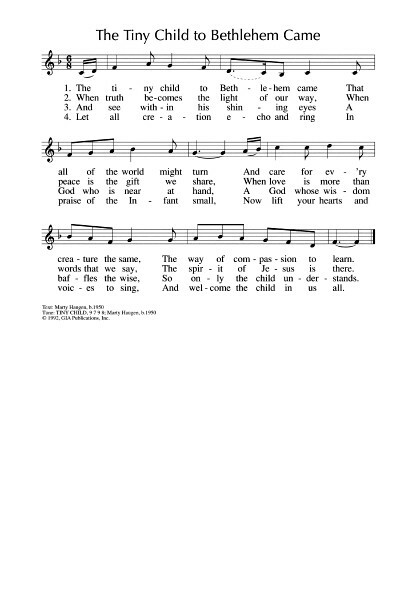 *CoC47 When Joseph and Mary (Gibson) Another good song for kids and adults too. The words are strong enough to shake adults up a bit, but fun enough for kids to enjoy as well. Good for kids. *TiS 325 / G(II)277 / GC371 / GC(II)381 / G(3)456 / Lau153 Who is the baby an hour or two old? Good for kids. 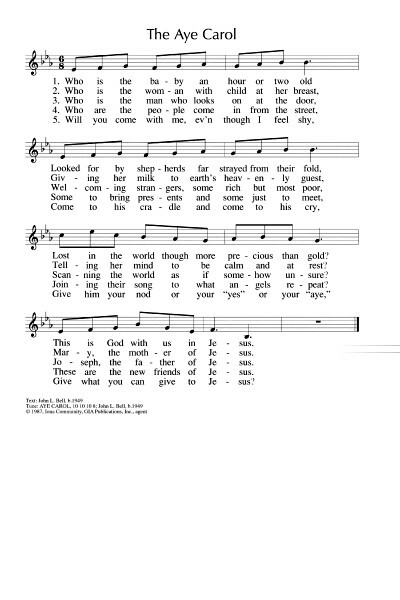 Online resource Bethlehem Night (Taylor) A lovely song for a children's choir; would be great at the end of a pageant. Sound sample and sheet music. Good for kids. VU068 / CP151 All poor ones and humble (Roberts) Lyrics. *TiS 309 / AHB 235 / NCH126 / CH324 / UMH220 / VU036 / LBW050 / ELW275 / GtG143 / CP143 / G(3)438 / CP(E) 44 / W&R189 / Cha149 / Srce2-29 / 82Hml-093 / Lau131 / StF190 / MP035 Angels From the realms of glory (Montgomery) Lyrics. Oldy-but-a-goody. AoV2-140 / NCH125 / UMH238 / VU038 / LBW071 / ELW289 / GA286 / HPP125 / PH022 / GtG113 / GC358 / GC(II)369 / G(3)430 / W&R188 / Cha155 / 82Hml-096 / Lau130 Angels we have heard on high (French traditional) Oldy-but-a-goody. *TiS 318 / AHB 242 / NCH124 / CH312 / UMH217 / VU069 / WoV644 / LBW067 / ELW278 / GA289 / HPP132 / PH025 / GtG114 / GC353 / GC(II)365 / G(3)448 / CP126 / CP(E) 45 / W&R203 / W&R205 / Cha147 / Srce51 / 82Hml-101 / Lau137 / StF191 / MP047 Away in a Manger (Mueller) I'm not wild about this carol. A non-crying baby. Doesn't sound fully human to me. Oldy-but-a-goody. *TiS 323 / AoV2-101 /ATA 141 / NCH152 / VU095 / PH030 / GtG158 / CP130 / W&R194 / StF193 / MP062 Born in the night Mary's child (Ainger) Oldy-but-a-goody. *TiS 319 / AHB 241 / CH314 / Lau141 / MP071 Child in the manger infant of Mary (Macdonald) Words of the outcast, infant Christ who becomes the victorious Redeemer. Sung to the well known tune BUNESSAN. CH has the original Gaelic text. Oldy-but-a-goody. TiS 306 / AHB 231 / CP(E)48 / Srce2-73 / 82Hml-106 / StF195 / MP080 Christians awake salute the happy morn Oldy-but-a-goody. *TiS 321 / AHB 245 Coldly the night winds winging I think this is one of the most beautiful carols in existence. AHB 233 / HPP140 / GC366 / GC(II)366 / 82Hml-105 God rest you merry gentlemen / people all Oldy-but-a-goody. *TiS 313 / AHB 238 / NCH129 / CH322 / UMH224 / VU035 / LBW055 / ELW288 / HPP97 / PH028 / GtG132 / GC(II)367 / G(3)435 / CP153 / W&R198 / Cha164 / 82Hml-107 / Lau139 / MP196 Good Christian friends / Good Christians all rejoice (Latin) Some versions have that odd bar "News! News!" in the middle. I wonder where that came from? Oldy-but-a-goody. *TiS 303 / AHB 227 / AoV1-171 / NCH144 / CH301 / UMH240 / VU048 / LBW060 / ELW270 / GA294 / HPP123 / PH031 / GtG119 / GC348 / GC(II)356 / G(3)424 / CP138 / CP(E) 53 / W&R185 / Cha150 / ZSS62 / Srce202 / 82Hml-087 / Lau155 / StF202 / MP211 Hark the herald angels sing (Wesley) One of those carols that we sing pretty much every year at Brunswick. Oldy-but-a-goody. PH034 / CP580 In Bethlehem a Babe Was Born Joyful, and good words. VU077 / PH035 / 82Hml-246 In Bethlehem a Newborn Boy (Herklots) Great words acknowledging the danger Christ was born into, the danger that still exists today, and Christ's redemptive power over it. *TiS 292 / AHB 225 / UMH229 / VU58 / LBW044 / ELW276 / HPP130 / PH037 / GtG128 / GC354 / GC(II)377 / G(3)445 / CP125 / W&R221 / Cha163 / Lau138 / MP342 Infant holy Infant lowly (Polish carol) One of my favourites; I'm profoundly shocked that we have not sung this recently at Brunswick. Lyrics and sound sample. *TiS 268 / AHB 224 / AoV1-170 / NCH132 / CH320 / UMH246 / VU59 / LBW039 / ELW267 / GA295 / HPP107 / PH040 / GtG134 / GC343 / GC(II)353 / G(3)437 / CP154 / CP(E) 57 / W&R179 / Cha143 / Srce399 / 82Hml-100 / Lau156 / MP393 Joy to the world The Lord is come (Watts) Oldy-but-a-goody. *TiS 317 / AHB 243 / NCH165 / CH316 / UMH242 / HPP95 / CP131 / CP(E) 59 / W&R210 / 82Hml-084 / StF210 Love came down at Christmas (Rossetti) Needs one small change in AHB to make it gender inclusive for people. NCH does this by replacing "all men" with "neighbour" in the last verse. I prefer the tune in TiS / AHB. Lyrics and odd-looking angels. Oldy-but-a-goody. *TiS 304 / AHB 228 / AoV1-167 / NCH135 / CH306 / UMH234 / VU060 / LBW045 / ELW722 / GA287 / HPP100 / PH041 / GtG133 / GC341 / GC(II)357 / G(3)439 / CP118 / / CP(E) 61/62 / W&R182 / Cha148 / Srce502 / 82Hml-083 / Lau159 / StF212 / MP490 O come all ye faithful (Oakeley) Oldy-but-a-goody. *TiS 316 / AHB 240 / NCH133 / CH304 / UMH230 / VU064 / LBW041 / ELW563 / GA296 / HPP112 / PH043 / GtG121 / GC363 / GC(II)359 / G(3)446 / CP120 / CP(E) 63 / W&R180 / Cha144 / Srce518 82Hml-078 / Lau127 / StF213 / MP503 O little town of Bethlehem (Brooks / Redner) Oldy-but-a-goody. *TiS 300 / NCH143 / CH294 / R112 / ELW274 / GtG112 / HPP118 / W&R222 / Lau134 / MP537 On Christmas night all Christians sing (Traditional English) Oldy-but-a-goody. *TiS 312 / AHB 237 / NCH145 / CH315 / UMH250 / VU062 / WoV643 / LBW261 / ELW550 GA297 / HPP137 / PH049 / GtG140 / GC372 / GC(II)380 / G(3)455 / CP123 / CP(E) 66 / W&R183 / Cha165 / Srce530 / 82Hml-102 / Lau148 / StF214 / MP539 Once in royal David's city (Alexander) Oldy-but-a-goody. *TiS 311 / AHB 236 / AoV1-168 / NCH134 / CH309 / UMH239 / VU067 / LBW065 / ELW821 GA290 / HPP135/ 136 / PH060 / GtG122 / G(II)262 / GC352 / GC(II)371 / G(3)441 / CP119 / CP(E) 69 / W&R186 / Cha145 / Srce610 / 82Hml-111 / Lau136 / StF217 / MP597 Silent night Holy night! (Gruber) Oldy-but-a-goody. VU047 / HPP124 / PH047 / GtG124 / W&R214 Still Still Still (Austrian) Lovely mushy baby Jesus song. *TiS 301 / AHB 221 / AoV1-169 / NCH139 / CH323 / UMH245 / VU90 / 91 LBW056 / ELW300 GA298 HPP108 / PH056 / GtG147 / GC377 / GC(II)388 / G(3)460 / CP139 / W&R229 / Cha151 / Srce2-550 / 82Hml-109 / Lau150 / MP644 The first Nowell the angel did say (English carol) Oldy-but-a-goody. *TiS 293 / AHB 218 / CH331 / VU054 / CP(E) 73 / 82Hml-098 / StF218 Unto us a boy is born (German carol) Oldy-but-a-goody. AoV1-165 / NCH148 / UMH219 / VU074 / LBW040 / ELW296 / HPP138 / PH053 / GtG145 / GC380 / GC(II)387 / G(3)466 / CP137 / CP(E) 74 / W&R184 / Cha162 / 82Hml-115 / Lau145 / MP749 What child is this? (Dix) Oldy-but-a-goody. *TiS 299 / AHB 223 / AoV1-172 / CH296 / UMH236 / VU075 / GA288 / HPP114 / PH058 / GtG117 / CP136 / CP(E) 76 / W&R228 / Cha154 / Srce2-662 / 82Hml-094 / Lau133 / StF221 / MP764 While shepherds watched their flocks by night (Tate) I really like the CH translation. Oldy-but-a-goody. Making great use of your suggestions (with acknowledgment, of course! ), so many thanks. thanks so much - again and again! to all who are lost or afraid in the night. as those who most need you, come bearing your face. shared tables of comfort and wide open doors. and whisper your wonder to our waiting ears. so all of creation can breathe in your peace.